A number of advanced pumps offered by Watson-Marlow Fluid Technology Group (WMFTG) have been certified to the NSF/ANSI 61 standard, a move that provides further assurance for water industry companies seeking safe and accurate chemical metering. Models in the Bredel and APEX ranges have become the first chemical metering hose pumps worldwide to achieve NSF/ANSI 61 accreditation for drinking water chemicals. A number of process pumps in the Watson-Marlow and Qdos series which use long life industrial tubing also carry the certification. When manufacturing, selling or distributing water treatment or distribution products in the USA, products are required to comply with NSF/ANSI 61 by 48 states. Furthermore, state agencies can order water producers to remove non- NSF/ANSI 61 certified products. The standard also carries weight in other countries as compliance indicates added value and a clear safety message, particularly as no other hose pumps are certified to date. 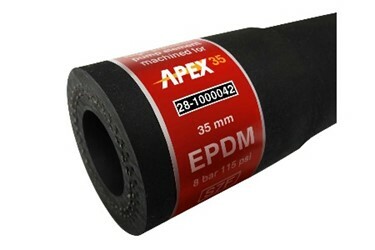 The certification covers APEX10, 15 and 20 hose pumps (with EPDM hoses), APEX28 and 35 (with EPDM and NR hoses) and Bredel 10 to 50 (seven models) with EPDM and NR Endurance hoses. As a result, water industry customers can now deploy NSF/ANSI 61 certified hose pumps in applications with flow rates up to 17,500 l/h and discharge pressures up to 16 bar (77 GPM / 232 Psi). Various hoses and inserts are certified for use with the approved chemicals listed on the NSF website and in Bredel’s ‘User Guide NSF/ANSI 61 certified hose pumps’. Naturally, the certification only remains valid if original replacement components are used for the wetted parts. Selected pumps in the Watson-Marlow 500, 600 and 700 series process pump range which use Marprene continuous tubing and Marprene LoadSure elements, as well as Qdos chemical metering pumps, have NSF/ANSI 61 accreditation. These pumps cover flows from microlitres up to 2,000 litre/hour and are widely adopted for water treatment applications where they are handling disinfectant chemicals and flocculants 24/7. ‘NSF/ANSI 61: Drinking Water System Components – Health Effects’ certifies that the chemicals and materials used in producing drinking water are safe and will not have negative health effects. The standard ensures that components of the process, such as pumps and hoses/tubing, will not add contaminants that will cause health or regulatory problems. For more information, visit www.wmftg.com.